Initial capacity testing was performed for a simulated midsized deployment of Microsoft SharePoint Server 2010 and other applications that included 30,000 SharePoint entities. This article describes the results of the capacity testing activities and contains guidance on capacity management for the Web Analytics service application in SharePoint Server 2010. In SharePoint Server 2010, the Web Analytics service application enables you to collect, report, and analyze the usage and effectiveness of SharePoint Server 2010 sites. Web Analytics features include reporting, Web Analytics workflow, and Web Analytics Web Part. For more information, see Reporting and usage analysis overview (SharePoint Server 2010). Description of the architecture and topology. Capacity planning guidelines based on the key factors such as total expected traffic and number of SharePoint components. Description of the other factors that affect the performance and capacity requirements. Before you continue to read this article, make sure that you understand key concepts related to SharePoint Server 2010 capacity management. The resources that are listed in this section can help you learn about frequently used terms and get an overview of the recommended approach to capacity management. These resources can also help you use the information that is provided in this article more effectively. SharePoint Web Analytics reports are typically aggregated for various SharePoint entities, such as sites, site collections, and Web applications for each farm. 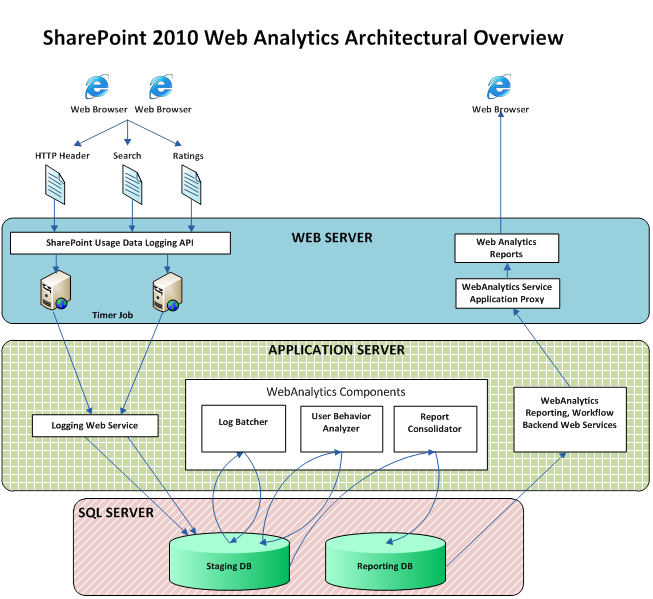 To view an architectural overview of the Web Analytics service application in a SharePoint deployment, see Architectural overview later in this article. The Web Analytics shared service requires resources primarily at the application server and database server level. This article does not cover the Web Server layer capacity planning, because the Web Analytics service’s capacity requirements are minimal at this level. Total expected site traffic (clicks, search queries, ratings). Number of SharePoint components (Site, Site Collection, and Web Application) for each farm. Other less significant factors which can affect the capacity requirements are summarized in Other factors later in this article. The following diagram (Figure 1) shows the flow of the site usage data from a Web browser to the analytics databases, and then back to the Web browser as reports. The usage data is logged to the usage files on the Web servers. The usage timer job calls the Logging Web Service to submit the raw data from the usage files. The Logging Web Service writes it to the staging database, where the raw data is stored for seven days (this is not configurable). The Web Analytics components Log Batcher and User Behavior Analyzer clean and process the raw data on the staging database. The Report Consolidator runs one time every 24 hours. The Report Consolidator aggregates the raw data from the staging database on various dimensions, and then writes it to the reporting database. The aggregated data is stored in the reporting database for a default period of 25 months (this is configurable). This section provides detailed information about the hardware, software, topology, and configuration of a case study environment. This environment is scaled to accommodate initial builds of SharePoint Server 2010 and other products. Therefore, the deployed hardware has larger capacity than necessary to serve the demand typically experienced by this environment. This hardware is described only to provide additional context for this environment and serve as a starting point for similar environments. It is important to conduct your own capacity management based on your planned workload and usage characteristics. For more information about the capacity management process, see Performance and capacity management (SharePoint Server 2010). This article does not cover the Web server layer capacity planning, because the Web Analytic service’s capacity requirements are minimal at this level. The following table describes the configuration of each application server. Based on the site traffic and the number of SharePoint components that are involved, users will need one or more application servers. Instances of SQL Server were required for both the staging and reporting databases. The following table describes the configuration of each database server. Although we used this disk size for our capacity testing, your environment will likely require a much larger disk size to support Web Analytics. We used the configuration that is described in the previous table for our capacity testing. Your environment will likely require fast, enterprise-class storage to support Web Analytics. For example, you will want to use a multi-disk RAID array or a similar disk configuration to increase Input/Output Operations per Second (IOPS) for daily incremental synchronization. In addition, we recommend that you spread the data load for SQL Server across multiple disk spindles. The following diagram (Figure 2) shows the Web Analytics topology. This section presents the capacity requirements with regard to the total amount of site traffic (this is measured by number of clicks, search queries, and ratings) per day that can be supported by different numbers of application servers and SQL Server based computers. The numbers presented currently are for a midsize SharePoint deployment that has about 30,000 SharePoint entities. The Web Analytics shared service aggregates the data for each day. Therefore, the data volume that is presented corresponds to the total number of records (this is measured by number of clicks, search queries, and ratings) that the SharePoint farm is expected to receive each day. Green Green values indicate the safe limit for the site traffic that can be processed for the corresponding number of application servers and SQL Server based computers. 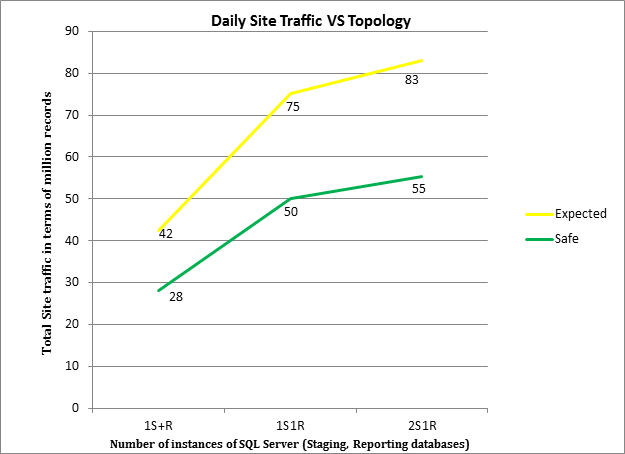 Yellow Yellow values indicate the expected limit for the site traffic that can be processed for the corresponding number of application servers and SQL Server based computers. Total site traffic, measured by number of page view clicks, search queries, and ratings. Number of SharePoint entities, such as sites, site collections, and Web applications, for each farm. The estimates also depend on other properties of the data and the data retention period in the reporting database. For testing, the other properties of the data were maintained as constant as described in Dataset description later in this section. Also, in smaller SharePoint deployment environments, you can share the application servers and SQL Server based computers together with other SharePoint services and databases. 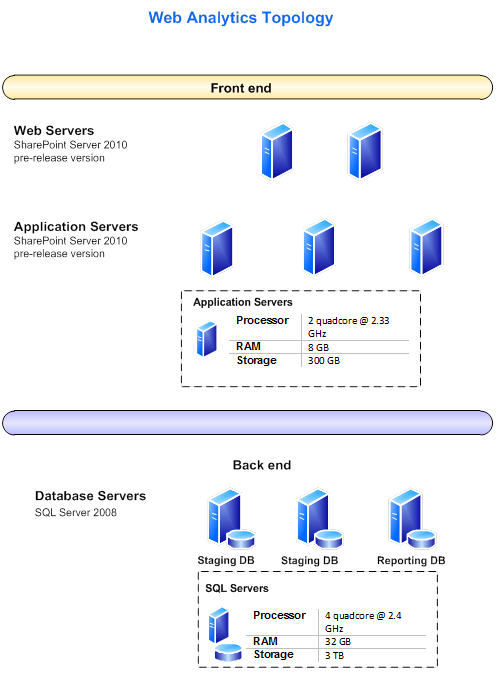 This article contains information about the capacity of the application servers and the SQL Server based computers that are in a test environment so that the Web Analytics shared service is the only major service that is running on the servers. The actual performance results for environments that actively use other shared services at the same time running might vary. To determine the capacity requirements for your environment, make sure that you estimate the expected daily site traffic and the number of components that you might use for a SharePoint deployment. Then, the number of application servers and SQL Server based computers should be estimated independently, as shown in Figure 3 and Figure 4. The dataset that was selected for the test environment has approximately 30,000 SharePoint components, which includes all web applications, site collections, and sites. Other characteristics of the data that were kept constant in the environment are also listed in the following table. The total site traffic, measured by number of clicks, search queries, and ratings, was increased as part of this case study to establish the number of records that can be supported by the corresponding topology. If you anticipate that you might exceed the capacity planning guidelines, we recommend that you turn off the Web Analytics service application. For more information about how to turn off a service application, see Starting or stopping a service. 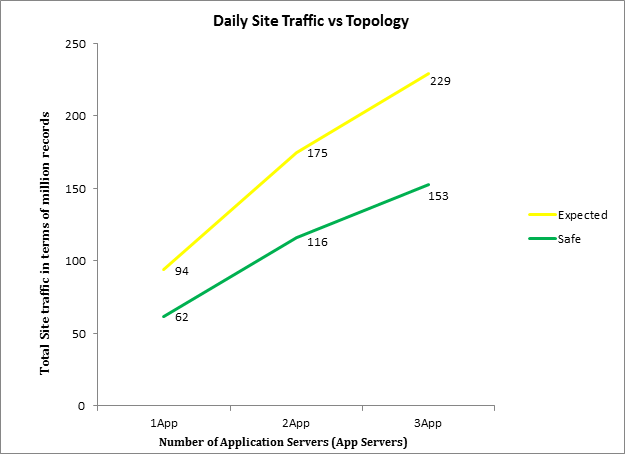 The following diagram (Figure 3) shows the daily site traffic that can be supported by one, two, or three application servers. The site traffic is represented in millions of records (each click, search query, or rating makes up a record) each day. The yellow line represents the expected number of records for the corresponding topology, whereas the green line represents the safe assumption for the number of records. The application servers are not very CPU-intensive or memory intensive. Thus, the CPU and the memory usage are not summarized for this section. One instance of SQL Server for both staging and reporting databases (1S+R). Two instances of SQL Server, one staging database and one reporting database (1S1R). Three instances of SQL Server, two staging databases and one reporting database (2S1R). The site traffic is represented in millions of records (each click, search, or rating makes up a record) each day. The yellow line represents the expected number of records for the corresponding topology, whereas the green line represents the safe assumption for the number of records. The following table summarizes the CPU and memory usage of the various components on the instances of SQL Server that are hosting the staging database and the reporting database. Number of unique queries each day. Number of unique users each day. Total number of unique assets clicked each day. Existing data size in the reporting warehouse, based on the data retention in the warehouse. The overall effect of these factors is less significant than the total data volume and the number of site entities. However, it is important to conduct your own capacity management based on your planned workload and usage characteristics. For more information about the capacity management process, see Performance and capacity management (SharePoint Server 2010).